These recordings were made by Geir Jenssen [aka ‘Biosphere’] while climbing ‘Cho Oyu’ in Tibet in September and October 2001. Cho Oyu is the sixth highest mountain in the world at 8201m, situated in the Himalayas near Mount Everest, on the Tibetan/Nepalese border. This album may be regarded as the soundtrack to the film of this journey. This CD also contains some of the source material for his recent Biosphere album, Dropsonde [Touch 2006]. Geir Jenssen is better known as Biosphere, who has released five albums on Touch over the last ten years. His most recent, Dropsonde, has been called “mesmerizing” by Straight No Chaser [UK], “gorgeous” [Word, UK] and “sublime” [Urb, USA]. More information on Biosphere and Geir Jenssen’s other work may be found on his website. Ash International recently celebrated the label’s 13th anniversary with a showcase in Stockholm featuring label stalwarts such as BJNilsen, CM von Hausswolff and Leif Elggren as the Kings of Elgaland-Vargaland, OCSID, with CMvH, Edvard Graham Lewis and Jean-Louis Huhta, and newcomers Alvars Orkester [Sweden] and Jana Winderen [Norway]. Au moyen de fields recordings attrapés sur Minidisc, Geir Jenssen (Biosphere) nous transporte au sommet du Cho Oyu, mont himalayen situé à la frontière tibéto-népalaise, auquel il s’est attaqué à l’automne 2001. Carnet de route sonore, Cho Oyo raconte 8201 m de transport. A terre (Zhangmu, Tingri), des bribes de conversations filtrant parmi clochettes et gongs, le bruit d’un moteur ou le chant d’un torrent. Et puis, après avoir mis en boucle un court passage de musique tibétaine retenue sur cassette (Jobo Rabzang), c’est l’ascension. A 5400 mètres de hauteur, Jenssen croise quelques bergers accompagnés de leurs troupeaux (Palung). Dernière présence animale, une nuée d’oiseaux (Cho Oyn Basecamp, Nangpa La). Cho Oyu 8201m sees Geir Jenssen, of electronic ambient project Biosphere, collecting together, manipulation and editing sound recordings from his trip up Cho Oyu in Tibet- the sixth highest mountain in the world. Each track follows a leg of the journey with a few minutes of related sounds and music. Jenssen skilfully takes ethnic music, radio jingles and all manner of harmonic audio sounds as a back bone for most of the track, then adds on top all manner of environmental sound be it; wind,animals or people- in a effective and entertaining manner. Making each piece a musically sound work in it’s own right and not just purely unedited field records. So as a result this is replayable and enjoyable more than simple field recording cd. It all comes in a wonderful oversize cd wallet with a full colour 12 page booklet detailing his trip with both pictures & text . On the back of the wallet is a map of the area covered, giving the feeling that real thought has gone into the booklet and wallet, much like the sound and music. Most people know Geir Jensen through his aka as Biosphere. Under this moniker he has released a range of cd’s in the ambient sector. In the 80’s he was part of a band called Bel Canto but he decided to work solo under the name Biosphere. The name being a reference to the Biosphere 2 Space Station Project. Jensen lives in a secluded town called Tromsö in Norway, keeping a distance from the noisy and busy world. I think that is more and more becoming a very relative notion since the Internet pervades every part of the Earth and everyone is easily accessible. But, it’s true, physical contact with someone living there is a different matter. This does not lead to solo releases exclusively because in the past years he worked together with Higher Intelligence Agency, Deathprod. and Peter Namlook (of the famous Fax recordings). Biosphere’s music varies but always circles around in the ambient area. Sometimes it’s more percussive than at other times when it features loops and droney harmonics. A few years ago he presented a new soundtrack to Dziga Vertov’s ’Man With A Movie Camera’ (1929) which I think was quite good. The atmosphere of the images is caught quite nicely. Touch now releases a cd under his own name, Geir Jenssen. I guess this done in order not to confuse the audience with the Biosphere work and indeed because this work is much more personal than anything Jenssen has released so far. 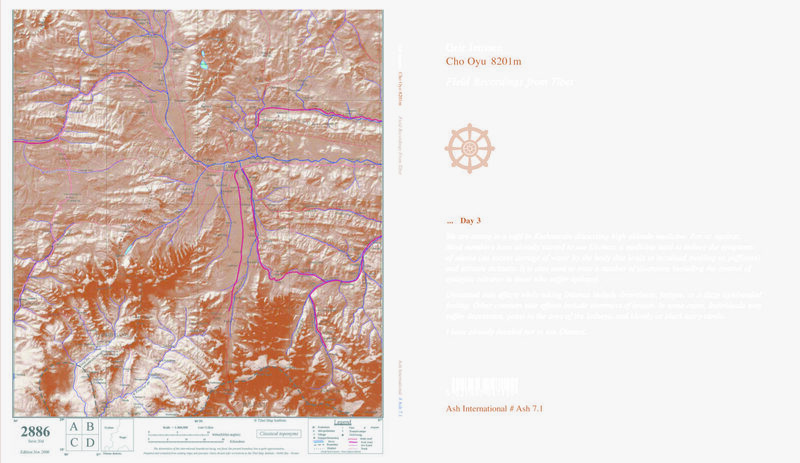 Cho Oyu 8201m contains, just like the subtitle says, field recordings from Tibet. The recordings have been made with a SonyMZ-R30 minidisc recorder and a Sony ECM-S959C microphone. It is quite different from the Biosphere stuff. Here, rhythm and melody are not the main characters but the recordings that are made while Jenssen climbed the Cho Oyu. Yes, we learn that Jenssen actually also is an experienced climber of high mountains. The cd is an audiolog / narrative composition that follows the time line of his journey to the summit of the Cho Oyu. We start the audio near the Nepalese/Tibetan border and then go up with the composer in 12 audio works. The complete textual narration, which is also presented in the book that comes with the cd, can be read online (http://www.biosphere.no/cho_oyu). Actually the text greatly improves the experience of the audio. I had my first listening before reading the text and it is interesting to read the thoughts I jotted down while listening. I must say that before listening to this cd I heard BJ Nilsen/C.Watson’s ‘Storm’. The latter, also is based on phonographic recordings. But whereas the Nilsen/Watson cd is more of a Turner-like depiction of a natural phenomenon, the Jenssen cd is much more narrative and almost cartoon-like. Jenssen’s compositions are layers and juxtapositions of recordings made during his trip at various stages. The scenery which he presents is like a Tin-Tin comic, with clear shapes and bright colors. In general there is little depth. The recordings are of good quality but the compositions are unable to take me along. During my second listening session I also read the text. If you have read more climber’s stories like “Into Thin Air” by Jon Krakauer then you know already a little about the climbing tourism. Krakauer wrote a wonderful book about this. Of course Jenssen’s report is much shorter, much more factual and closer to his own experiences. This, together with the audio on the cd, enhances the experience and actually while reading and listening I had a great time. As with all Touch releases this one is beautifully designed and carries a booklet with other climbing photographs that make the experience even better. Schon die Verpackung bricht mit Format und Aufmachung konventioneller CDs, und auch die Entstehungsgeschichte hört sich ungewöhnlich an. Doch was ist schon »normal« bei Geir Jenssen alias Biosphere? Die Aufnahmen entstanden bei Jenssens Besteigung des sechsthöchsten Berges Cho You an der tibetanischen/nepalesischen Grenze. Seine 45tägige Bergtour, die den Nordnorweger an den Rand seiner physischen Grenzen brachte, kann man im umfangreichen Booklet nachlesen und auf CD nachhören. The ascent to the peak of a gigantic mountain is something that few humans are able to experience; even those who manage to make a serious attempt are often turned back by the mental and physical demands that such a task entails. And while it in no way substitutes for actually undertaking such a climb, Geir Jenssen’s Cho Oyu 8210m is, in a small way, a chance for the listener to make the trip, at least in their mind, and while it can’t compete with the bone-chilling visuals of a professionally shot documentary, there’s something quite affecting about Jenssen’s field recordings, and the accompanying short diary that details the notable events of his journey to the top of the world’s sixth-highest peak. Jenssen, a Norwegian known to ambient techno fans as Biosphere, traveled to Kathmandu on the first leg of his expedition, and began a 45-day saga that led him to the top of Cho Oyu, part of the Himalayas, on the Tibetan/Nepalese border. Traveling with a minidisk recorder and a microphone, Jenssen recorded his aural environment throughout the trip, with the addition, at times, of the sounds pulled in via his transistor radio. Cho Oyu 8210m is a document of his trip, presented in stages, from the trip between the town of Zhagmu and the border, to the different basecamps along the trek, to the literal apex of Jenssen’s trip at the titular altitude of 8,201 meters. While much of the journey took place on the cold face of the mountain and in seemingly spartan camps along the way, Jenssen was able to collect a surprisingly diverse collection of sounds, from the bells, whistles, and grunts of herders directing a yak caravan at the Paling campsite, to passing airplanes, neighboring birds, and the rather ominous wheeze of some of his fellow (and less fortunate) climbers on oxygen. Jenssen’s recording of the summit, mainly the sound of wind on a microphone (before what seems like more transistor transmission makes an entrance) is what one might expect from the entire disc, but Jenssen’s ear is able to find subtle sounds worth hearing along the trip, like an airplane far overhead, and his use of the shortwave brings fittingly fragile bits of music into the mix, bringing the recording (and Jenssen) back to earth in a sense, as such reminders of humanity were likely comforting diversions in the cold of the camps, especially as Jenssen climbed higher and human companionship grew scarce.